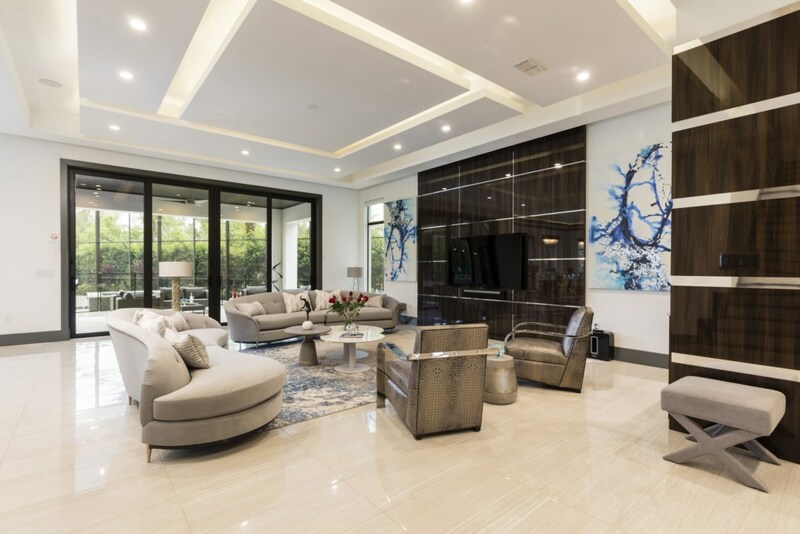 Welcome to the Villa of Dreams where an elegant ambiance flows through this home from the grand foyer entrance into the luxurious open plan living, dining and kitchen area all furnished and equipped to the highest standard ensuring your comfort and every need is catered too. 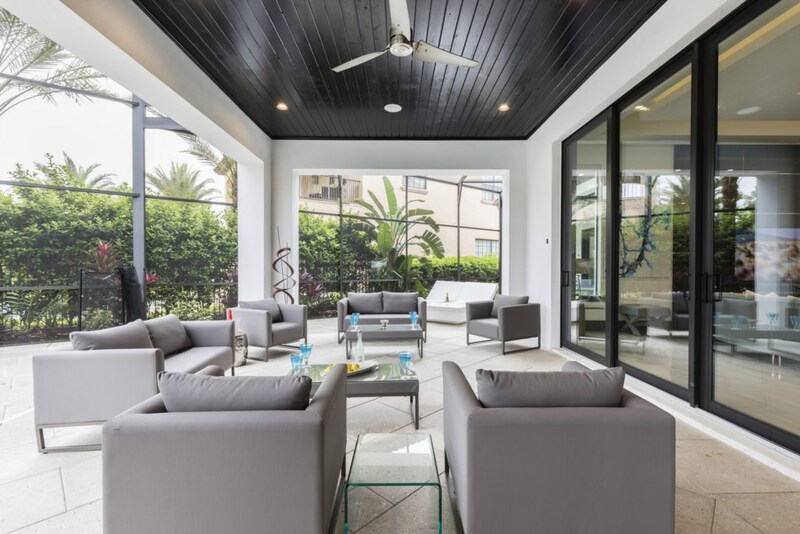 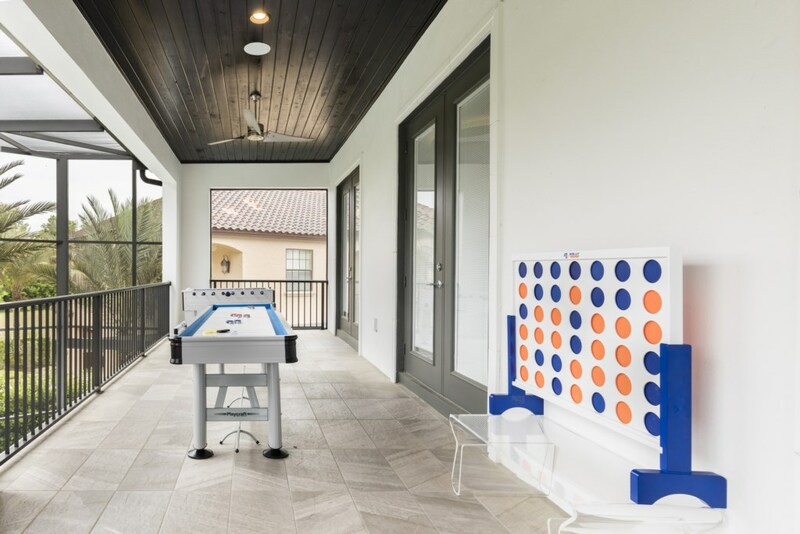 Relax on the spacious screened patio with its private swimming pool, spillover spa and decorative water features as well as a ping pong table for hours of family entertainment. 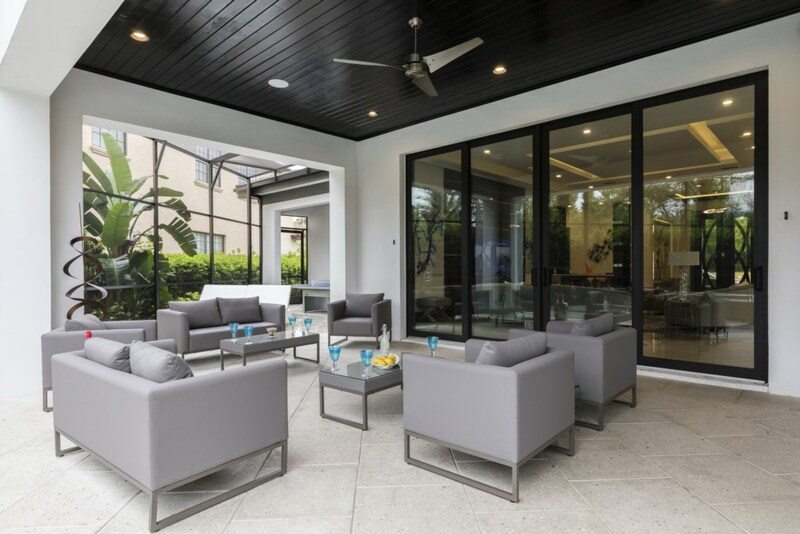 A built-in summer kitchen where all your al fresco meals can be prepared and served whilst enjoying serene water and conservation views. 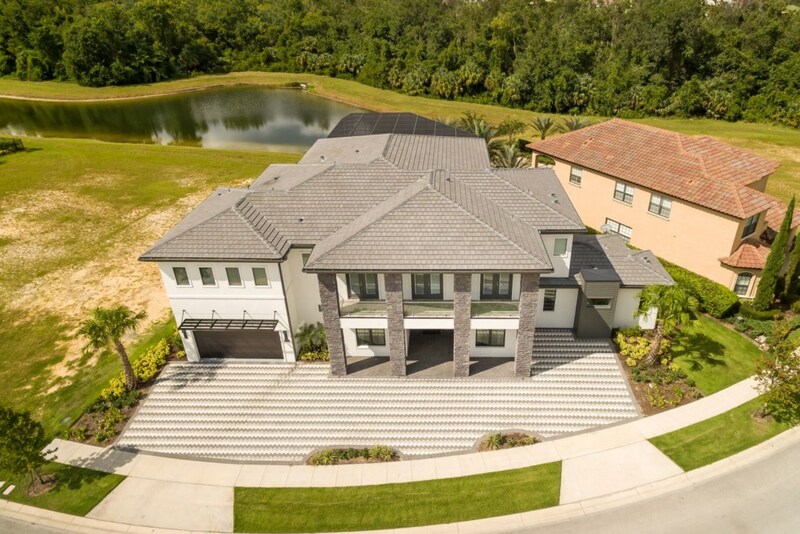 Located in the prestigious Reunion Resort and Spa, the perfect home base for exploring everything Central Florida has to offer. 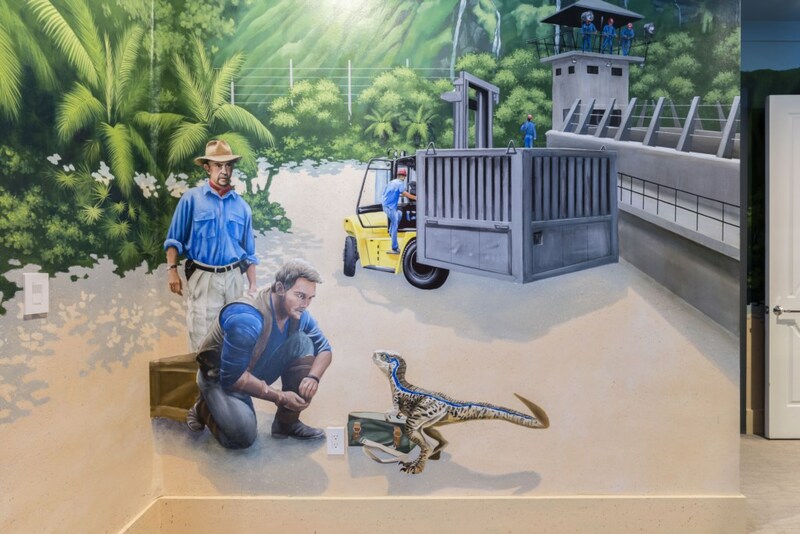 Have you ever dreamed of waking up on an isolated island where dinosaurs roam, a soaring tower where you could befriend a lost princess, or a bioluminescent lab with technology that allows you to fly? 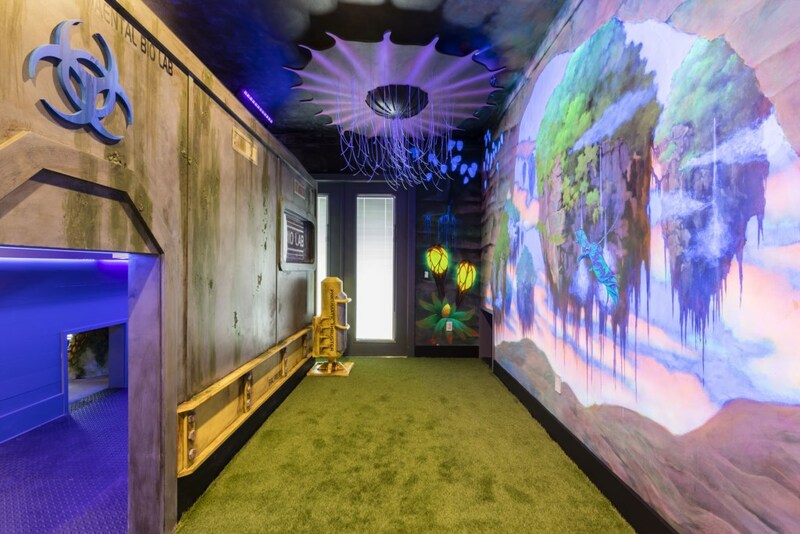 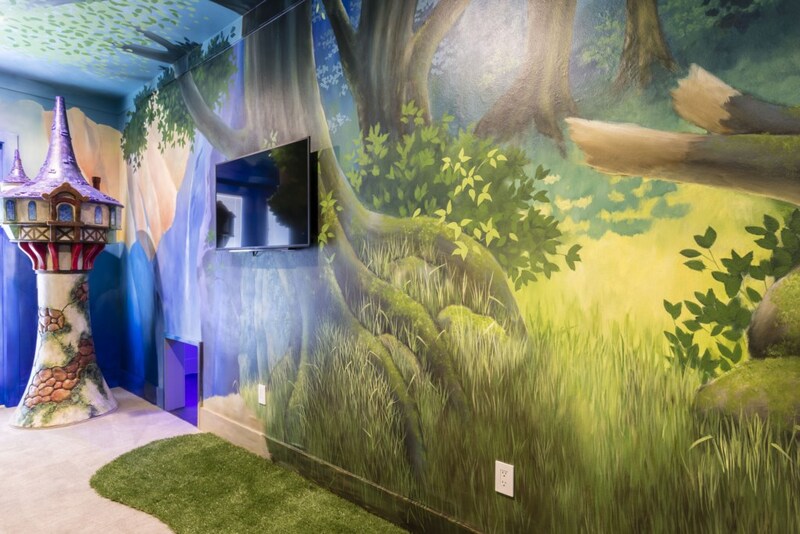 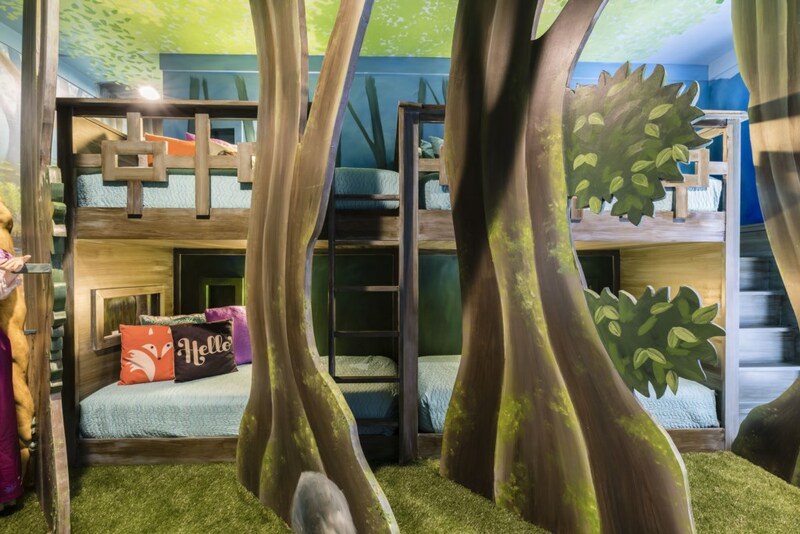 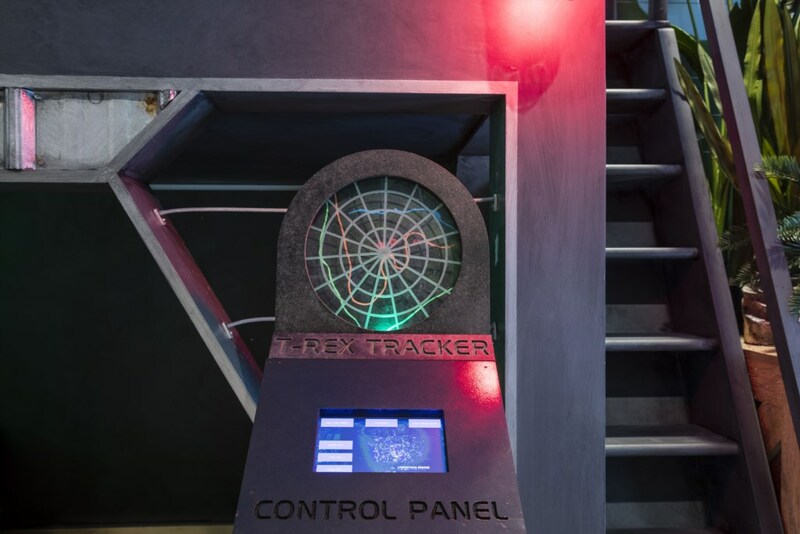 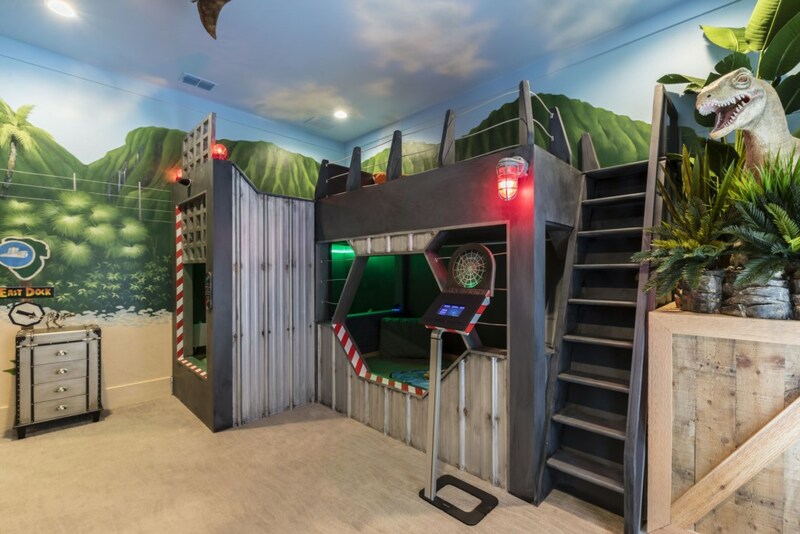 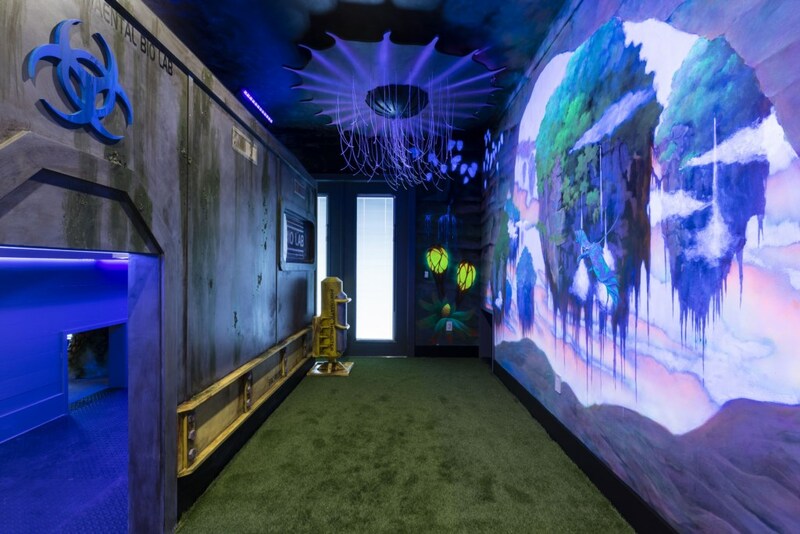 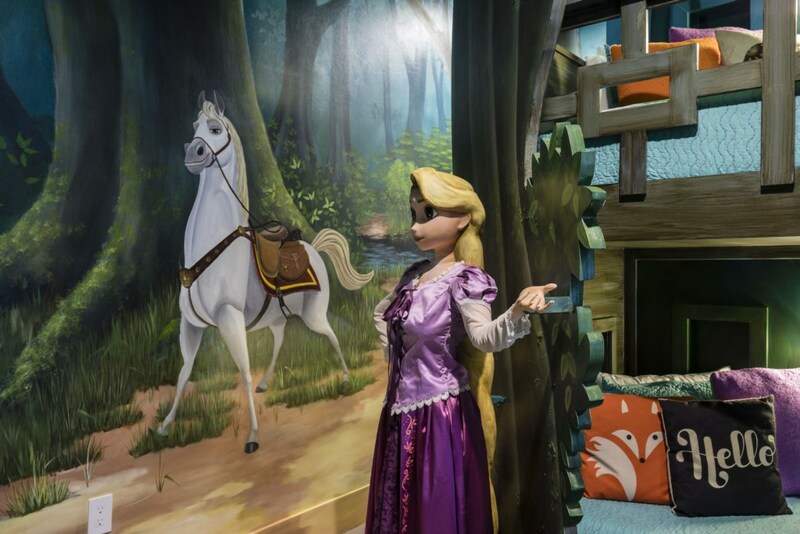 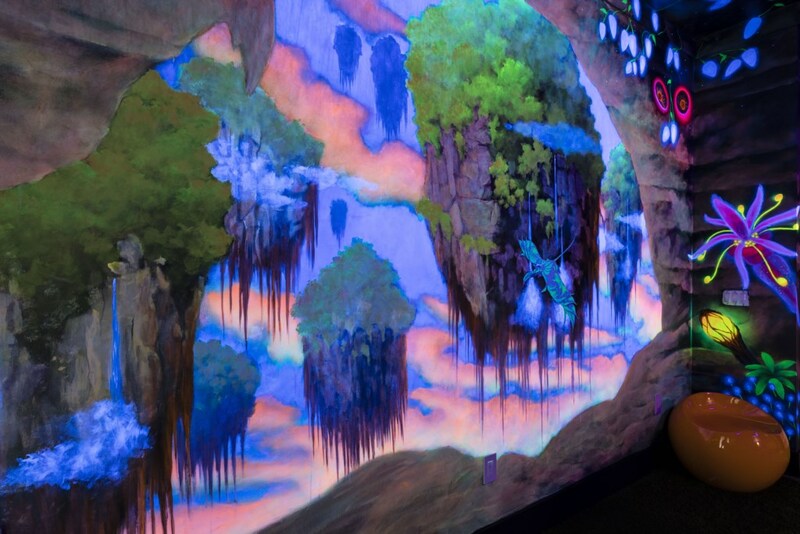 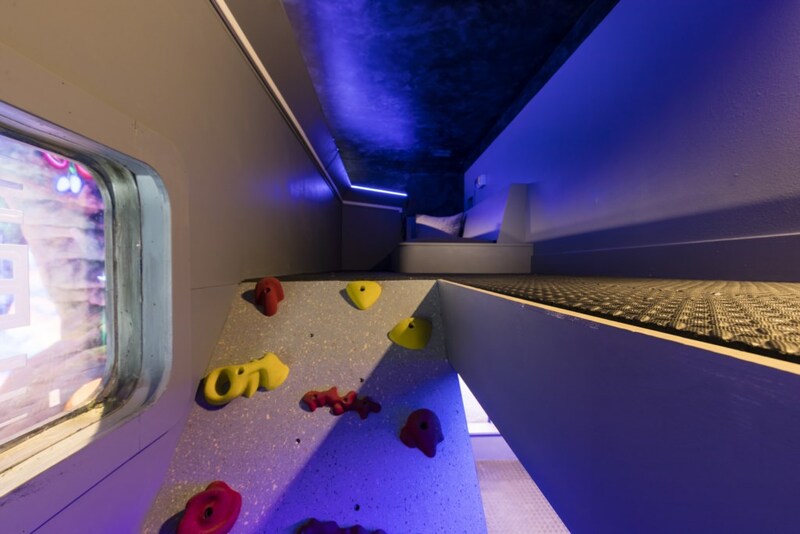 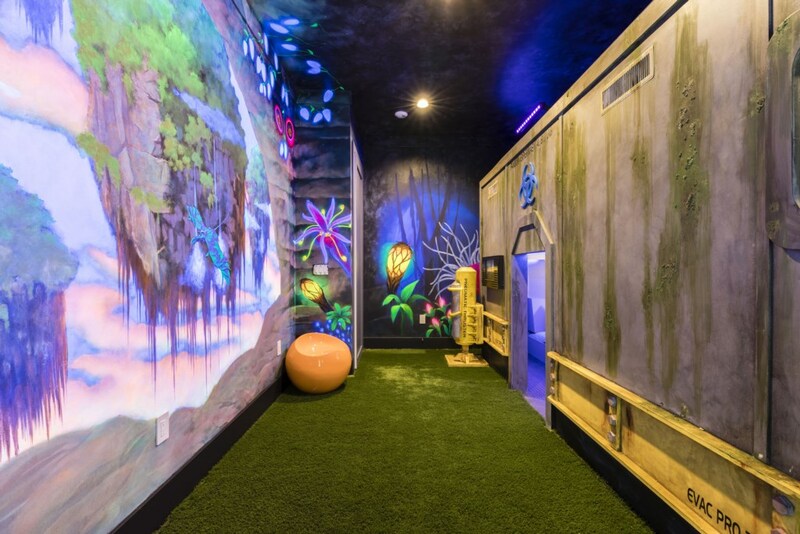 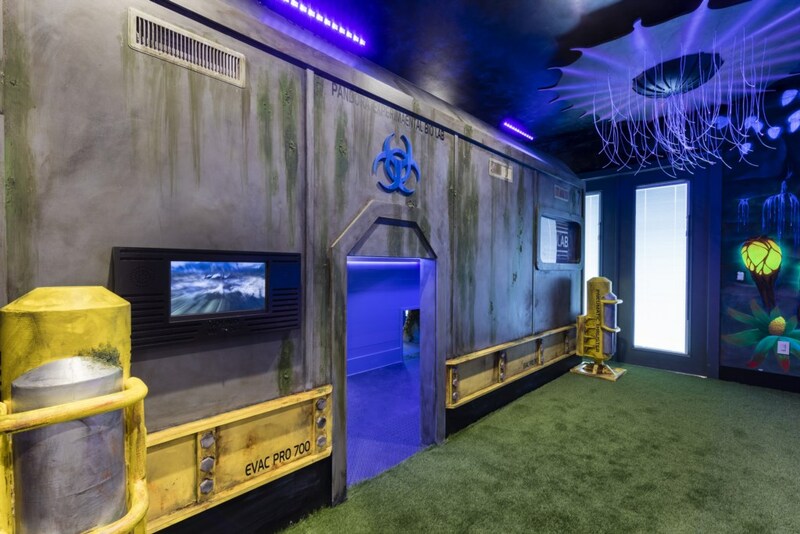 Interactive control panels let the children’s imagination run wild in the dinosaur themed bedroom whilst the secret tunnels create a perfect place to play hide and go seek between the children’s bedrooms. 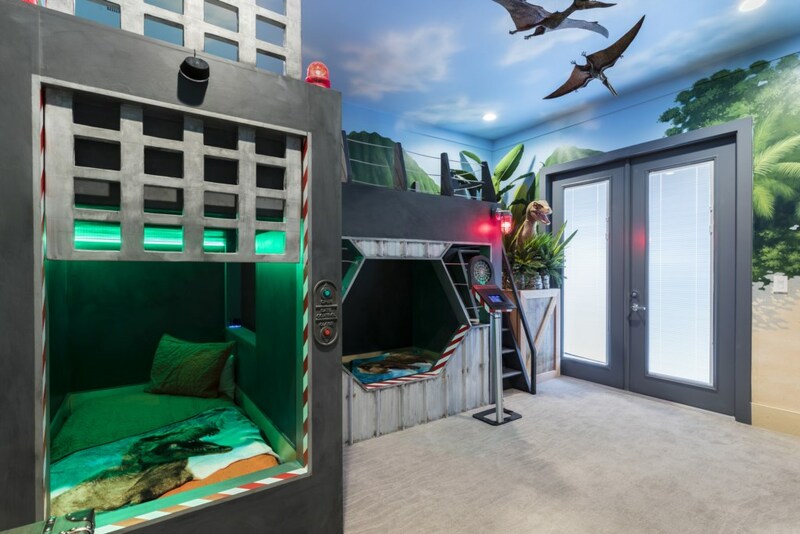 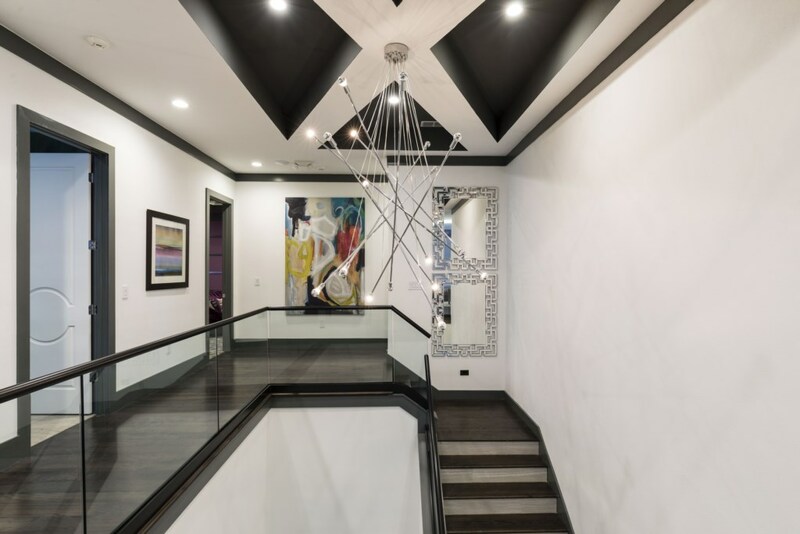 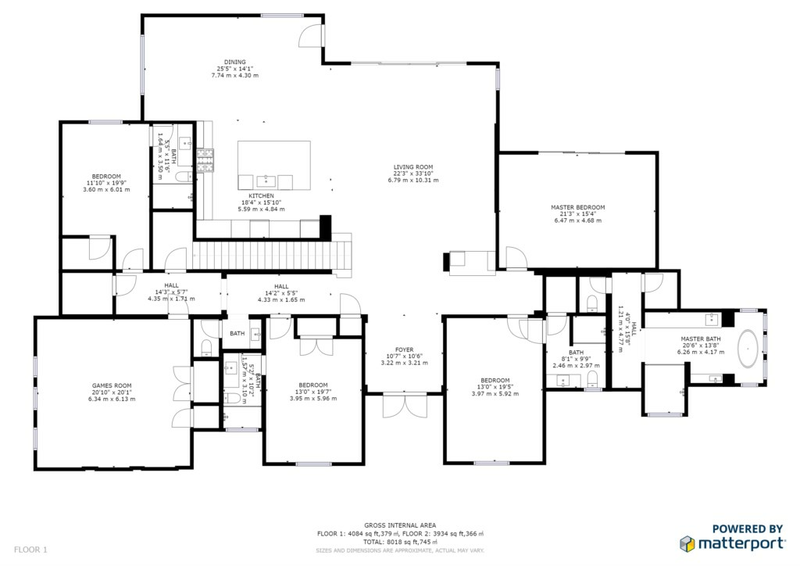 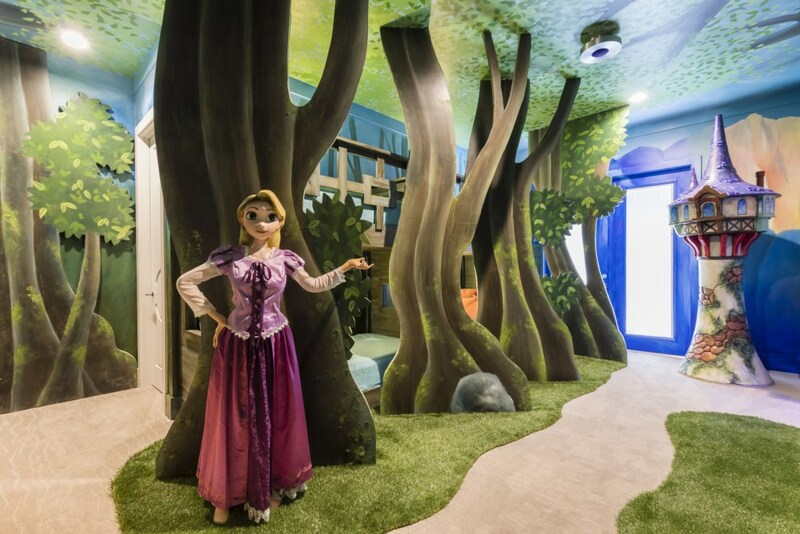 Your children’s dreams can become a reality when you stay at this amazing home. 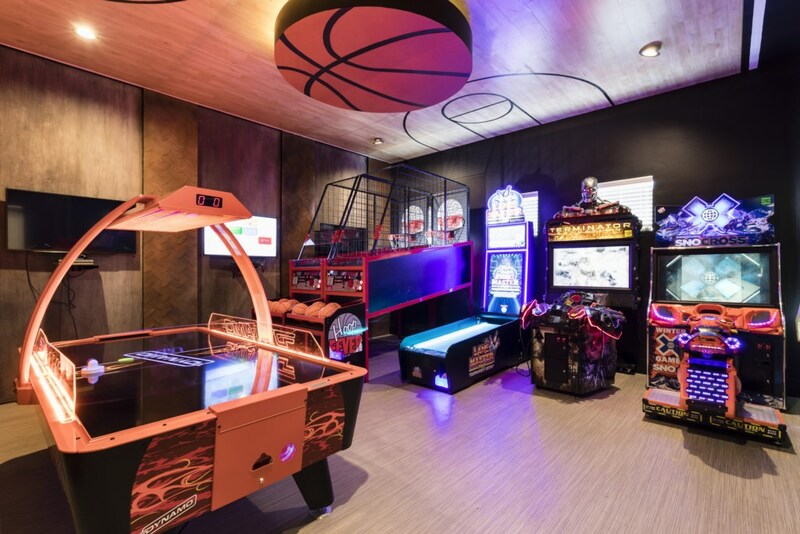 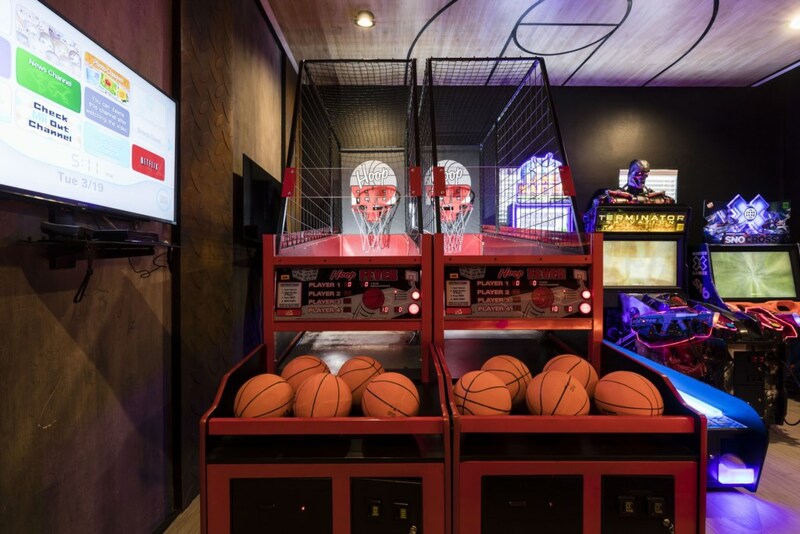 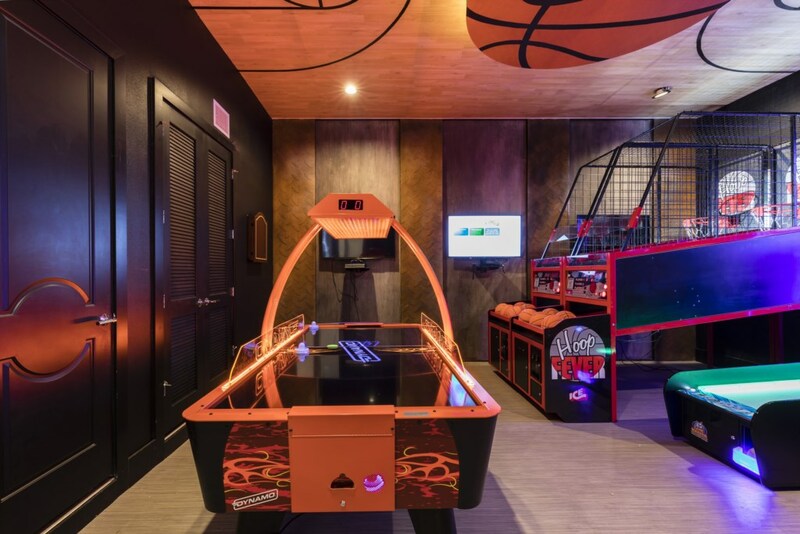 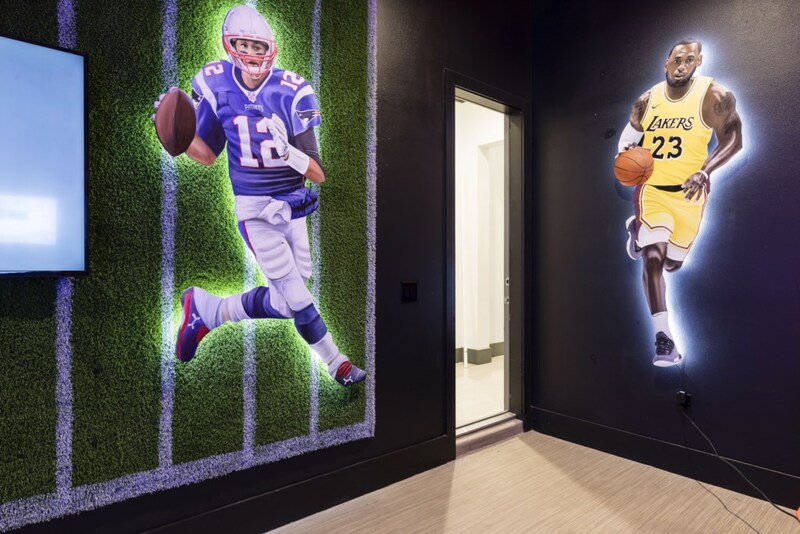 A state of the art games room offers air hockey, basketball, a bowling simulator, a snowboarding race and flat screen TV’s to play the games consoles creatively decorated in a basketball theme is the epitome of what an arcade should look and feel like. 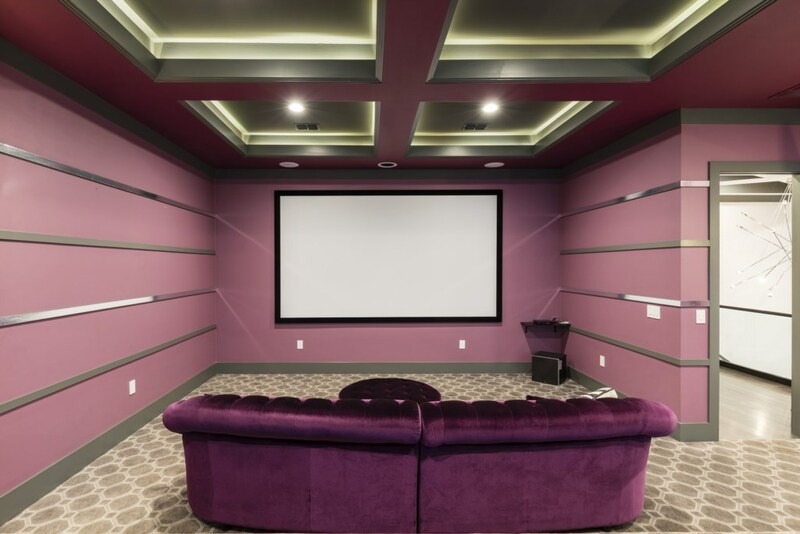 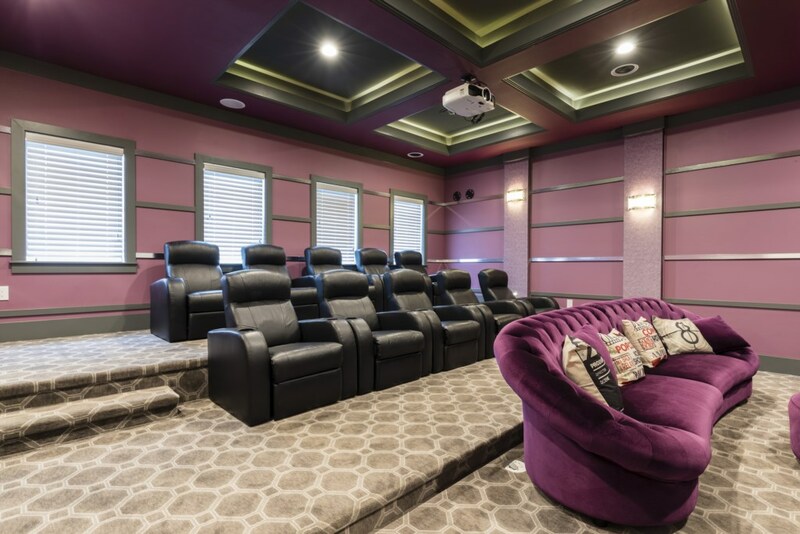 A home theater is an added incentive to allow for quality time with loved ones while you watch your favorite movies on the big screen from the comfort of the leather recliners or curled up on a luxurious sofa, the choice is yours! 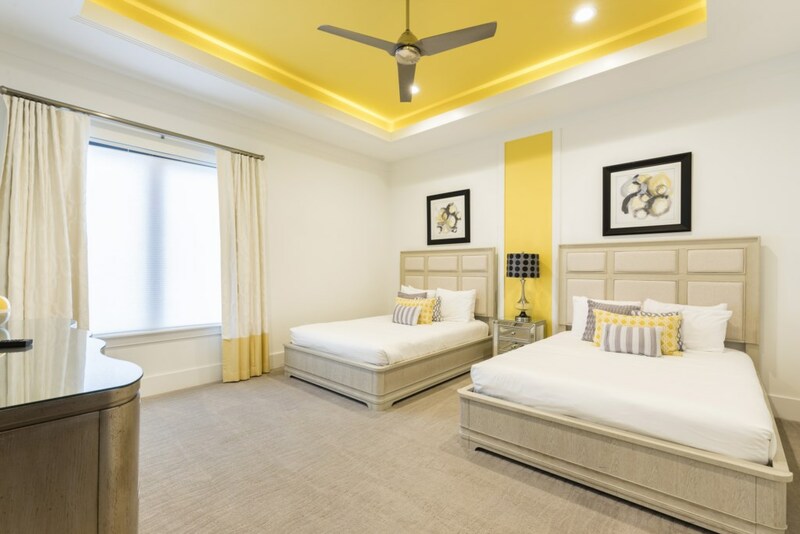 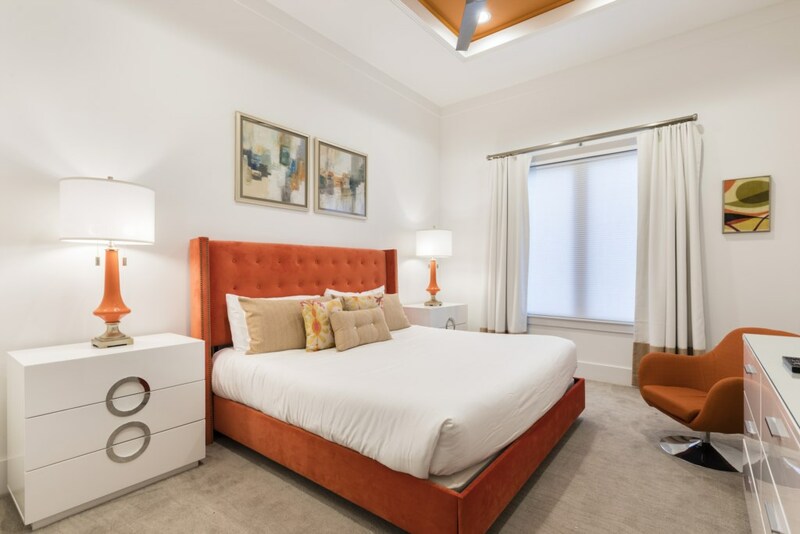 10 spacious and luxuriously decorated bedrooms are located throughout this home, four of them on the ground floor with a total sleeping capacity up to 26 guests. 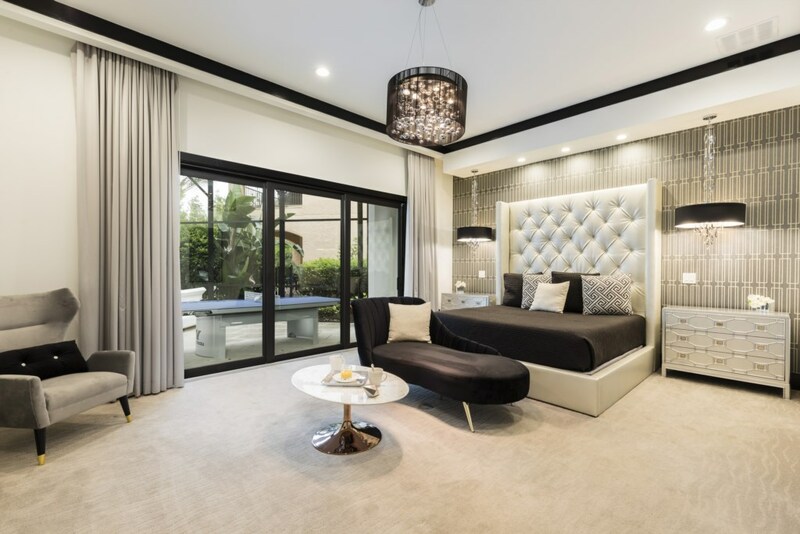 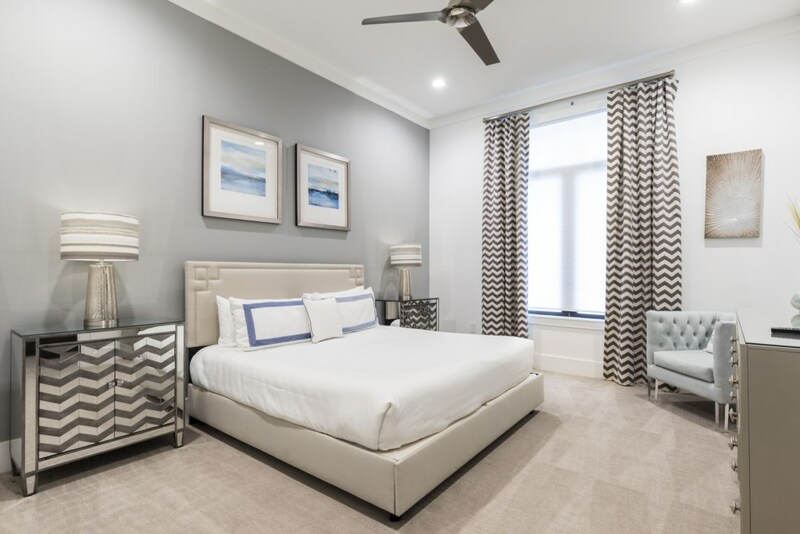 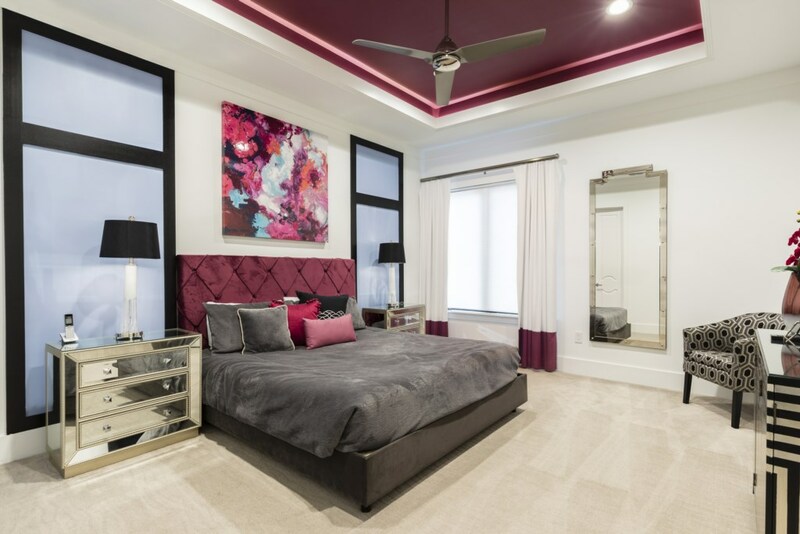 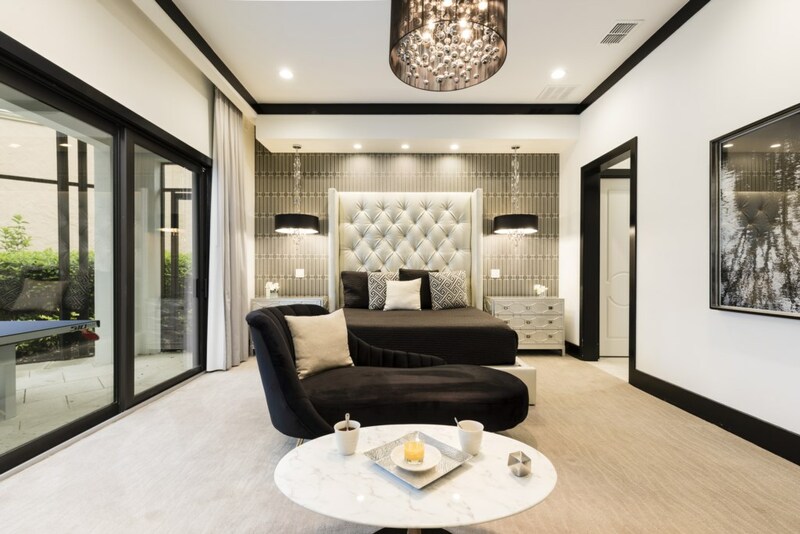 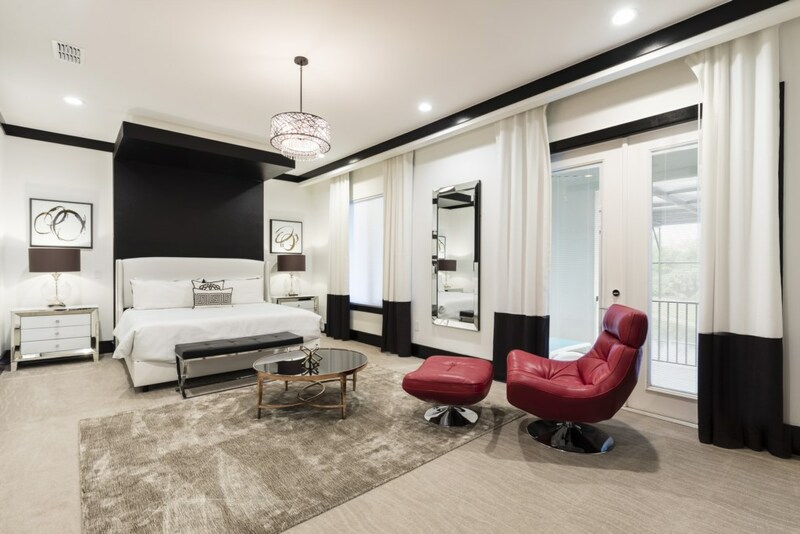 Whilst every bedroom is spacious and furnished to the highest standards this home does offer two outstanding king master suites, one located on the ground floor with pool deck access and the second on the first floor with balcony access. 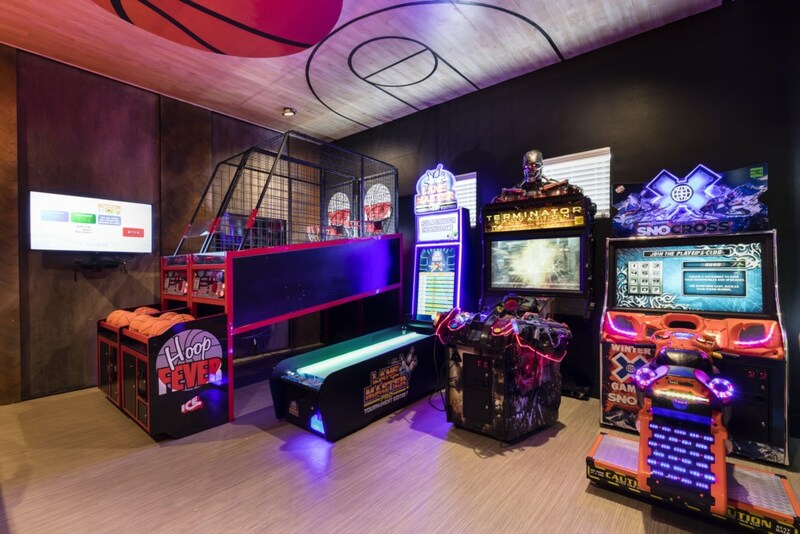 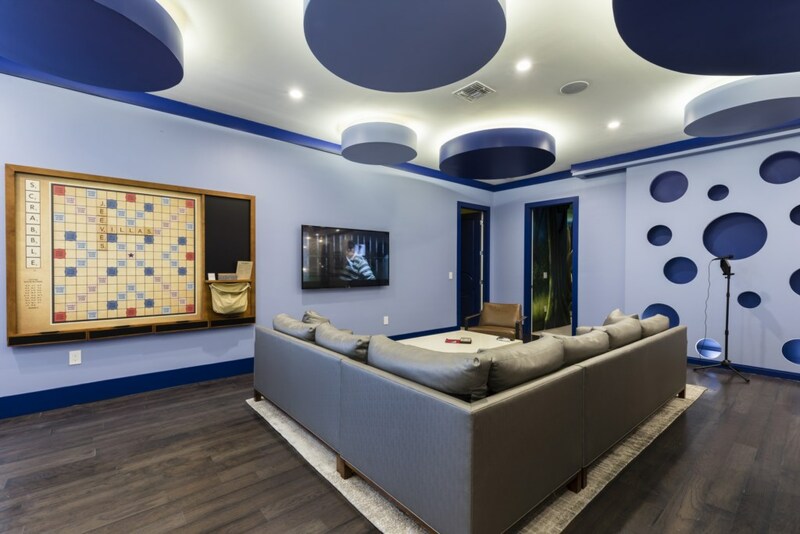 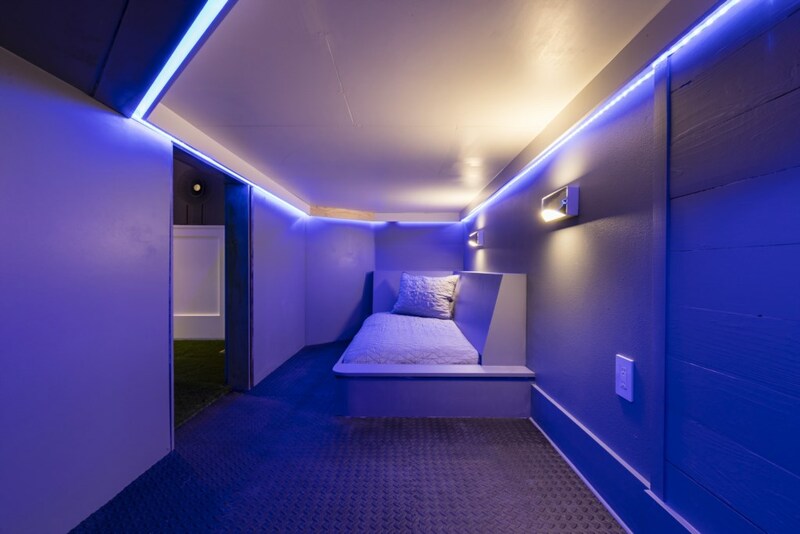 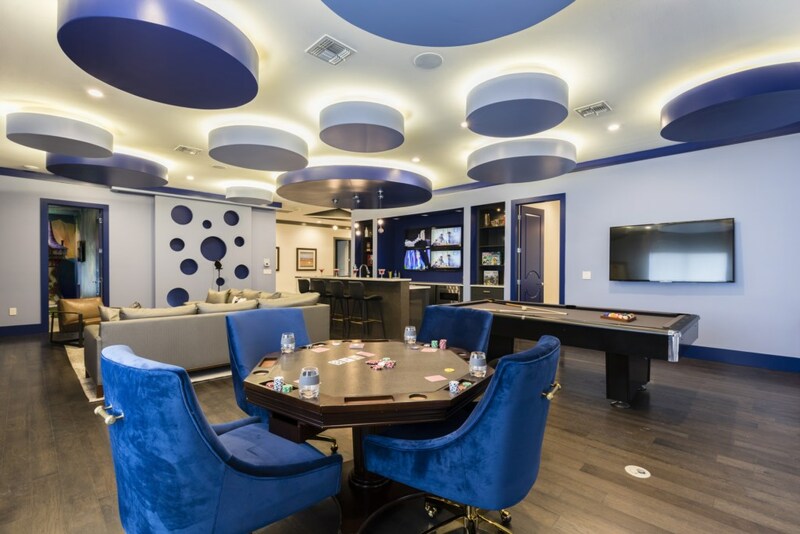 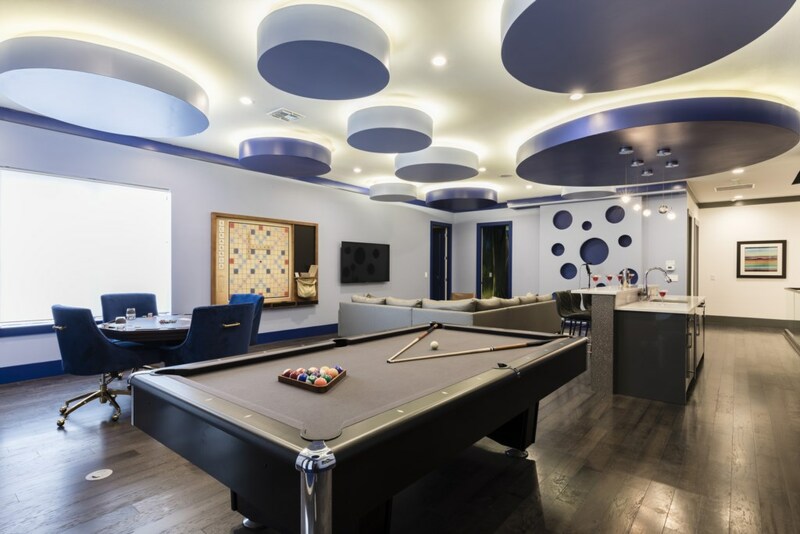 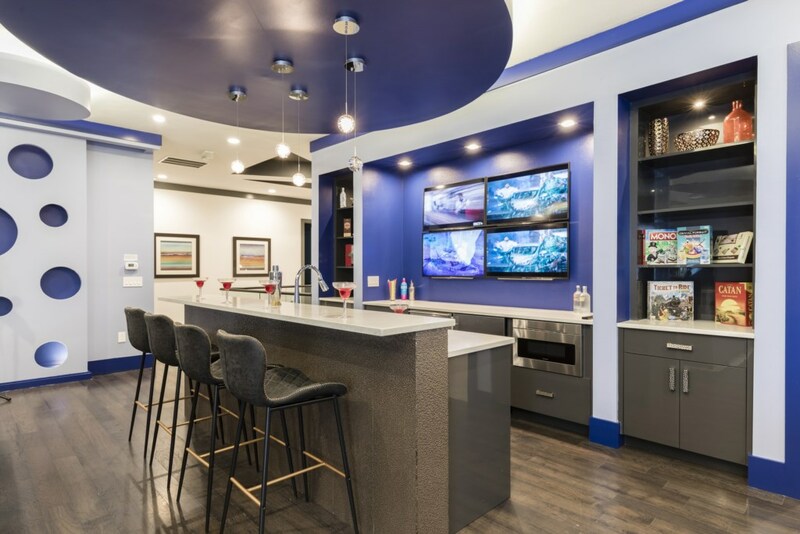 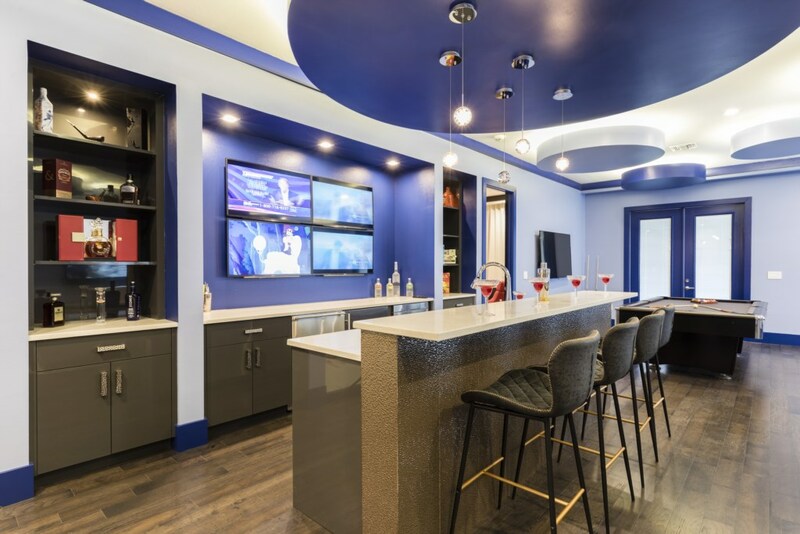 As if all this wasn’t enough, the loft area offers a full built in bar, pool table, karaoke, games/poker table, multiscreen TV’s to give that sports bar feeling opening onto a rear balcony with relaxing loungers, foosball, shuffleboard and giant connect 4. 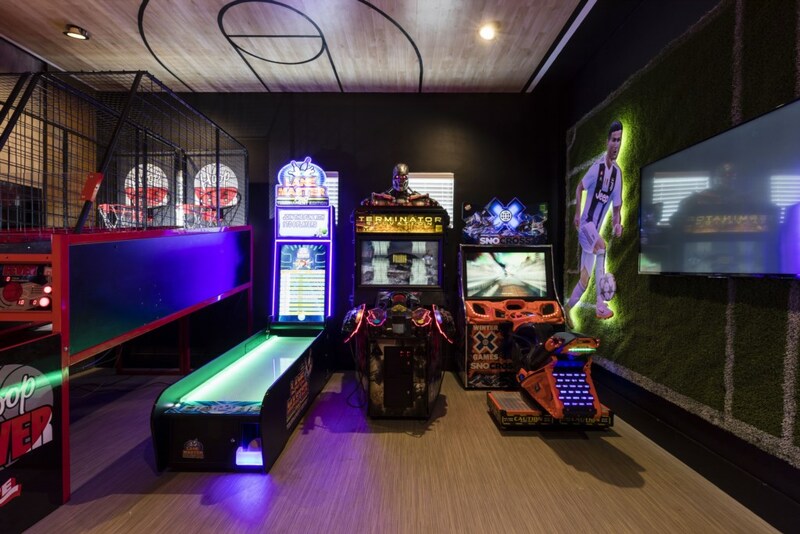 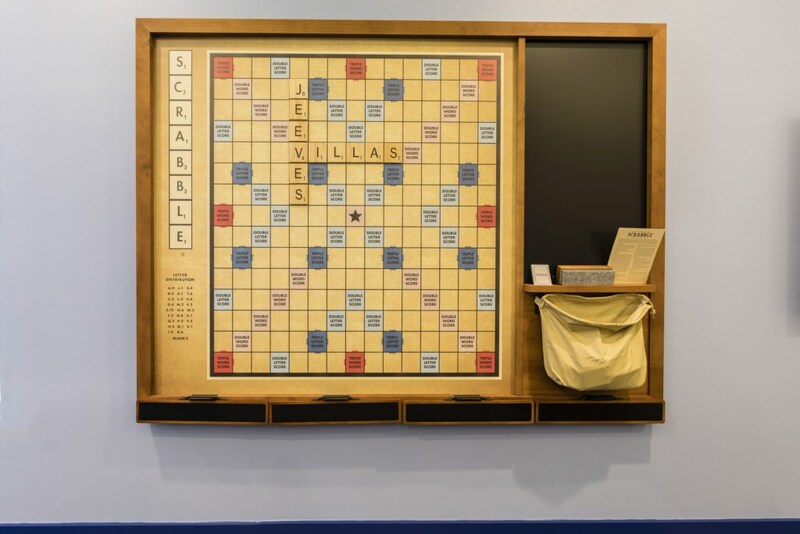 After a day at the theme parks and local attractions come home, relax, play, compete, swim, the choice is yours because this really is the Villa of Dreams! 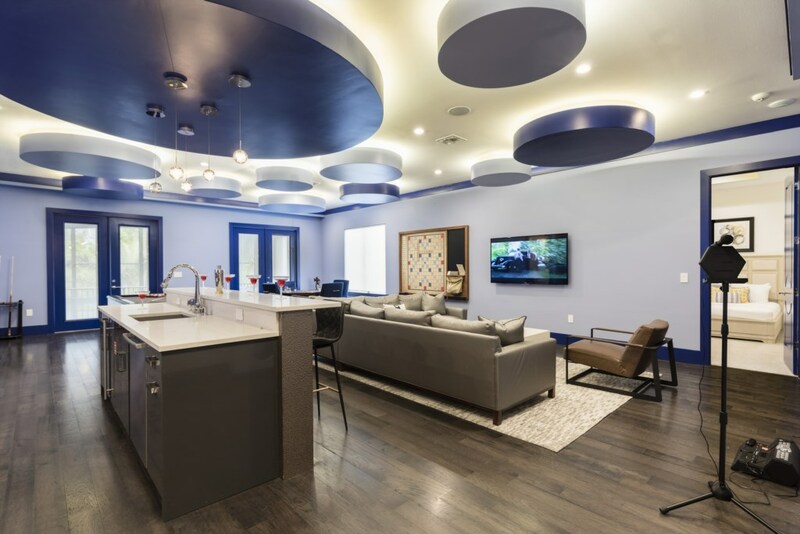 Reunion Resort is just 5 miles from Walt Disney World and is widely recognized as Central Florida's best luxury vacation home resort. 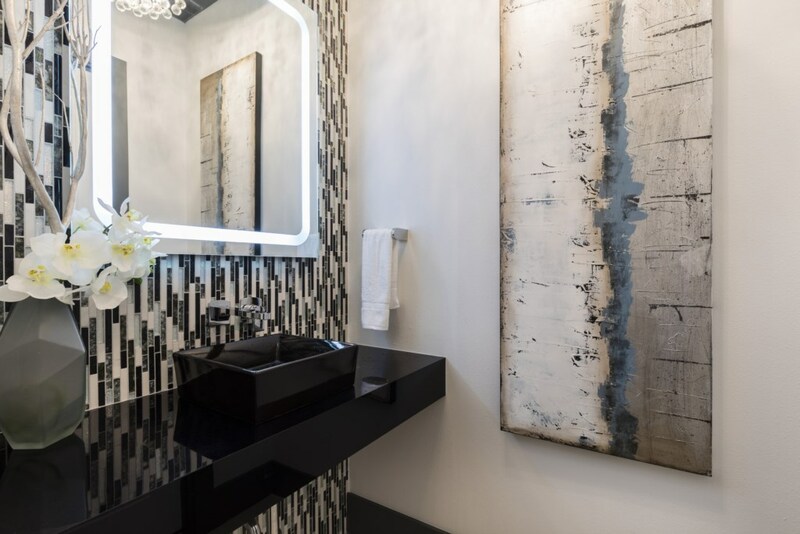 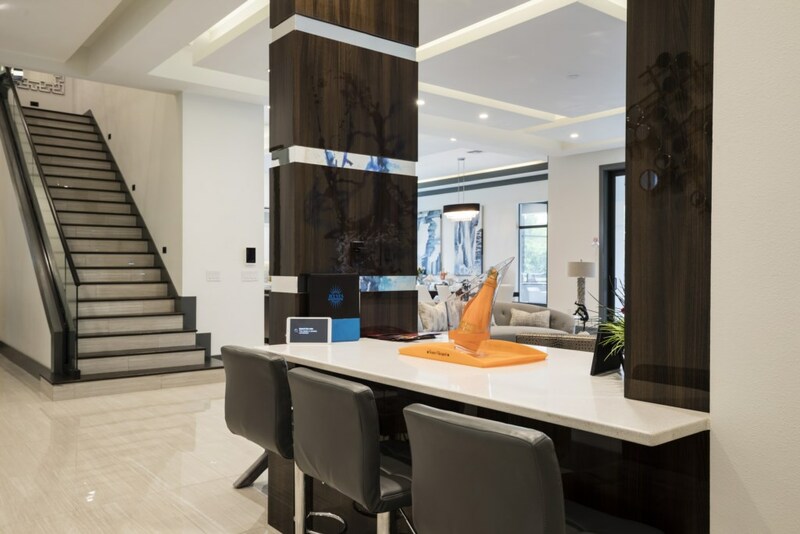 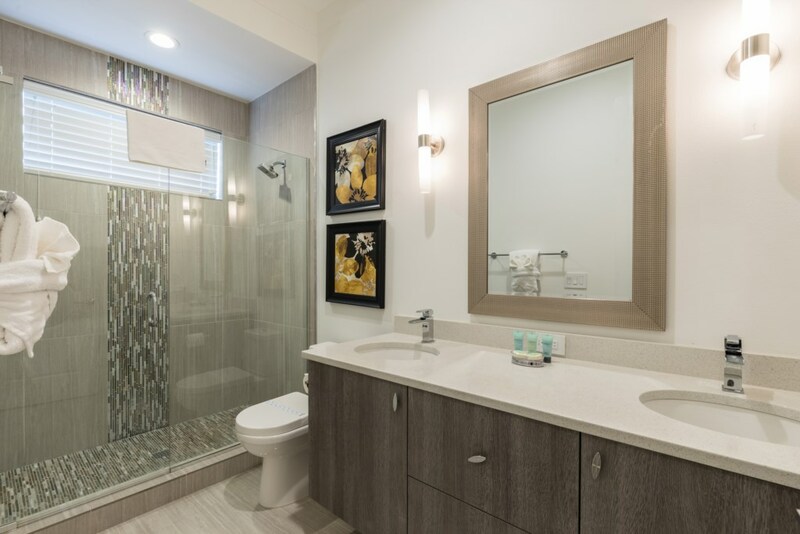 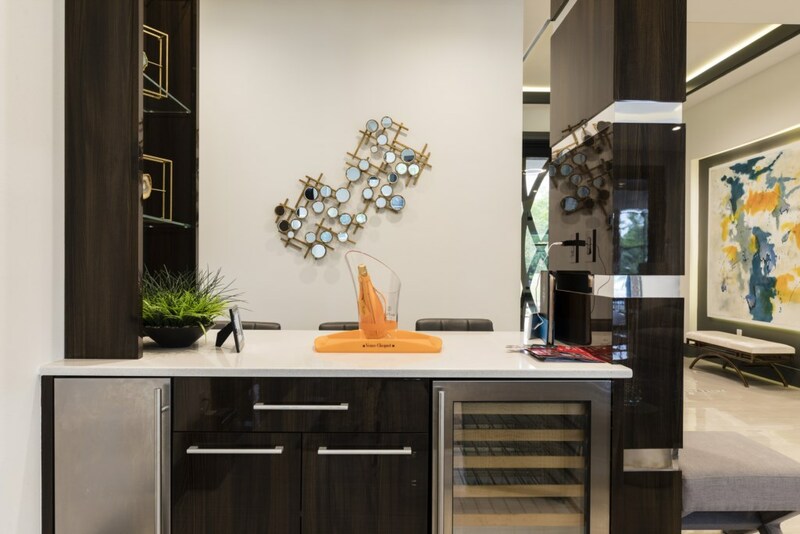 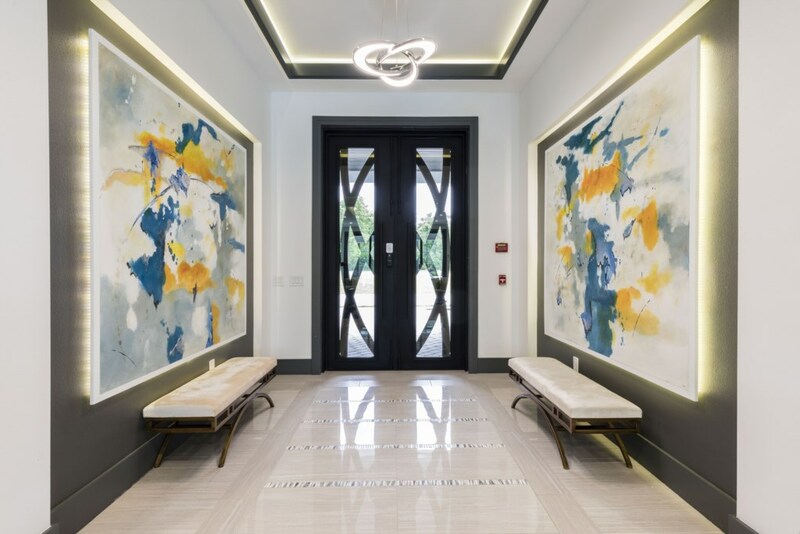 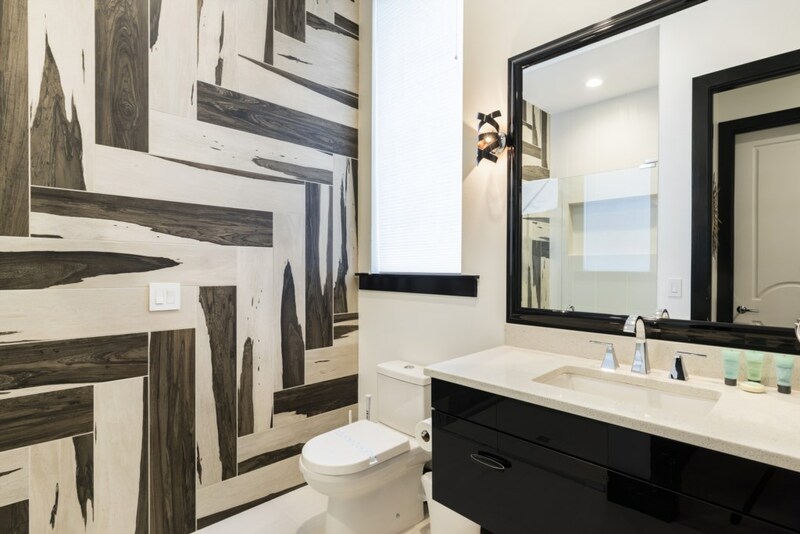 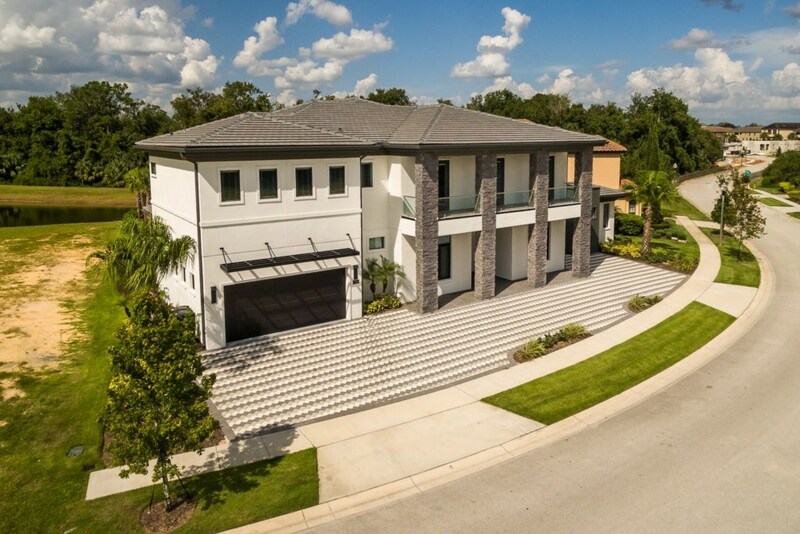 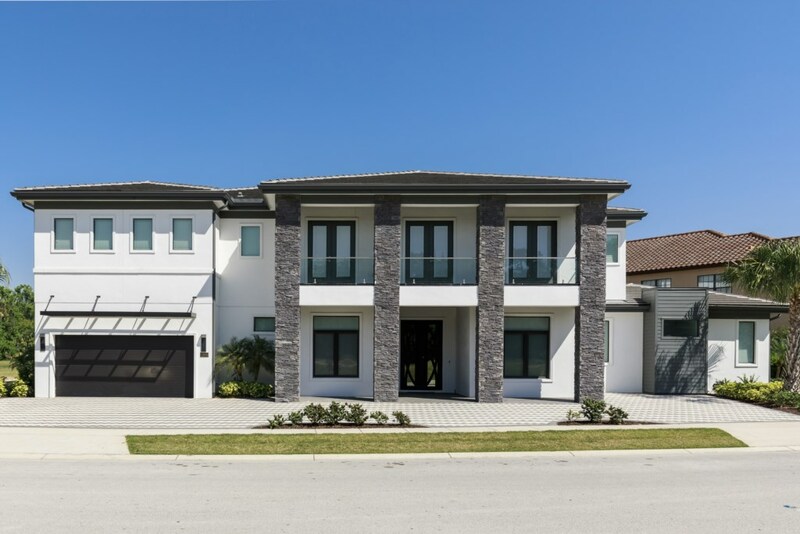 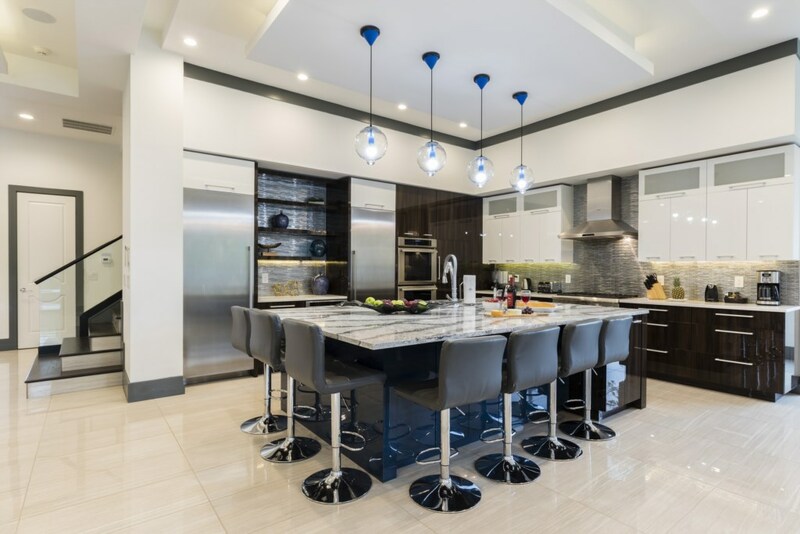 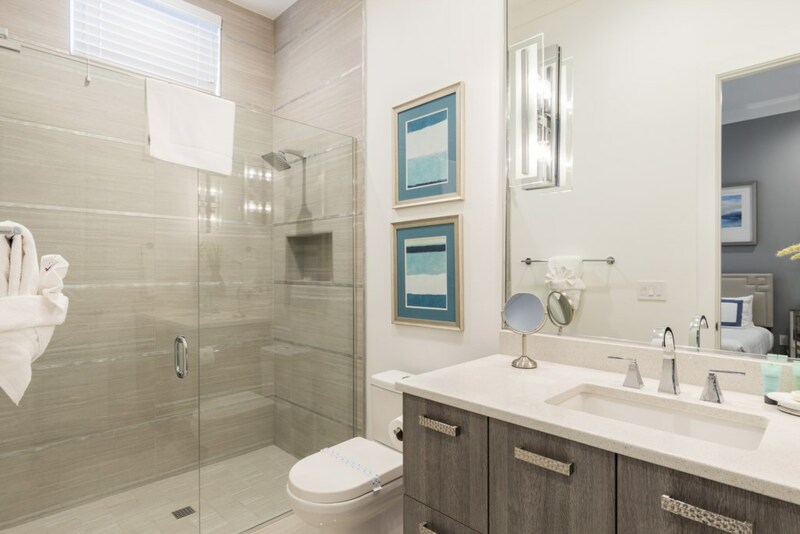 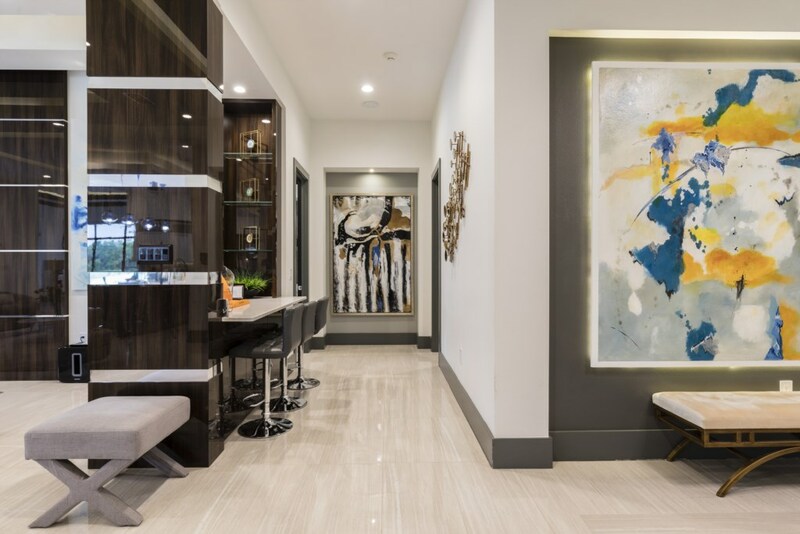 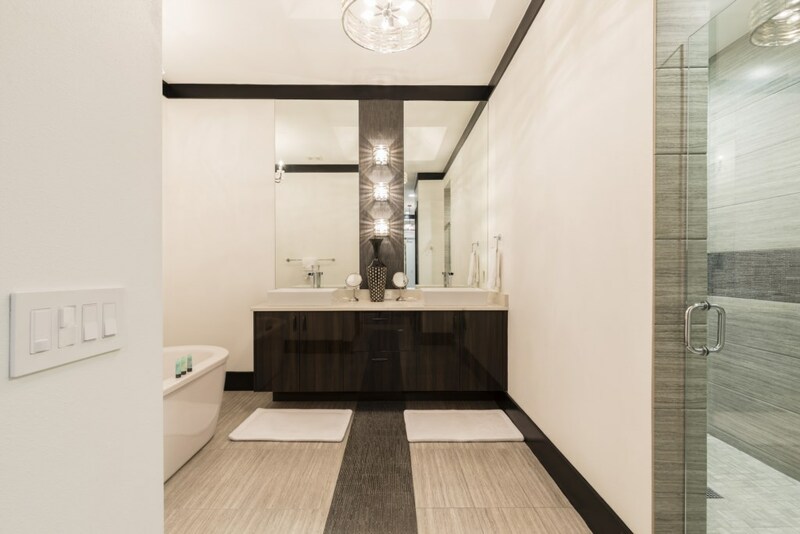 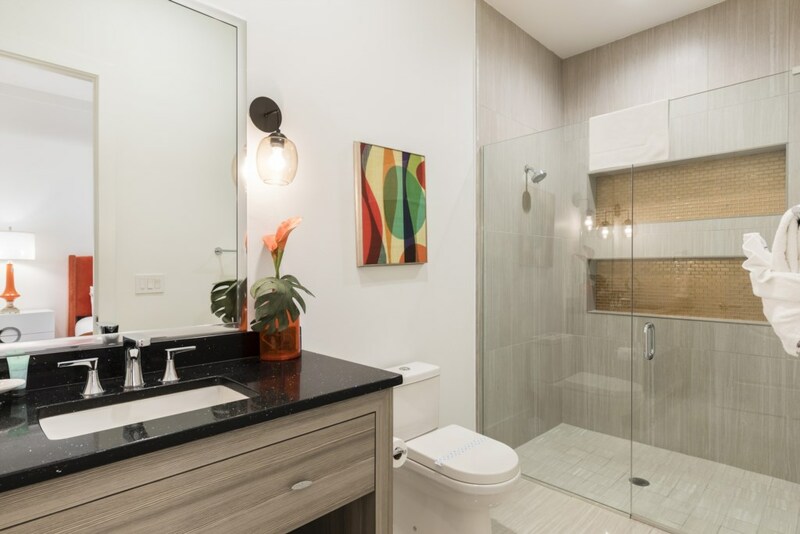 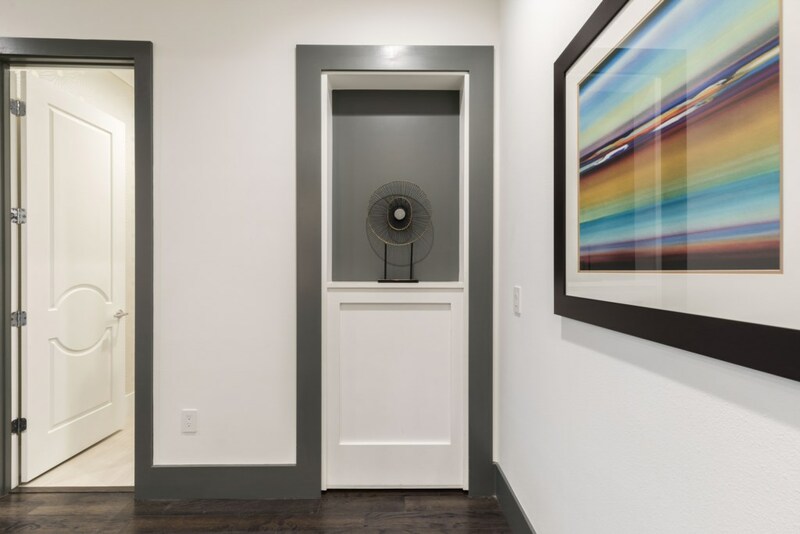 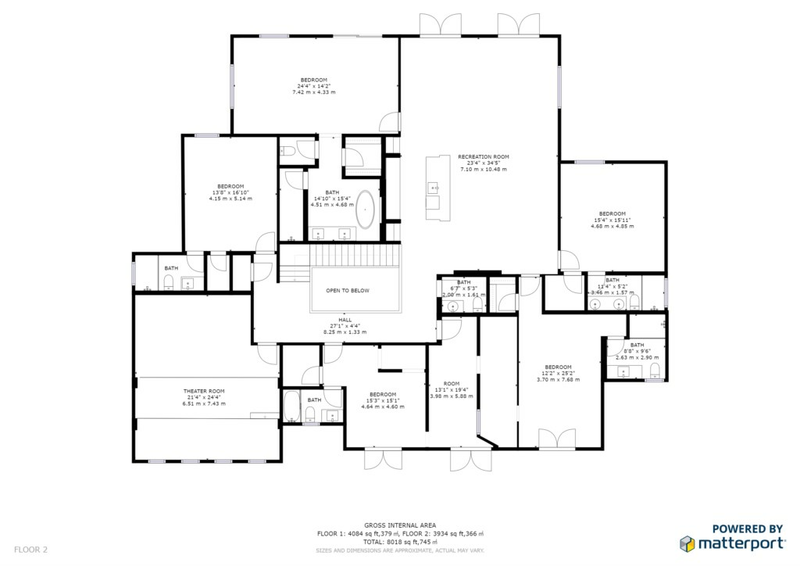 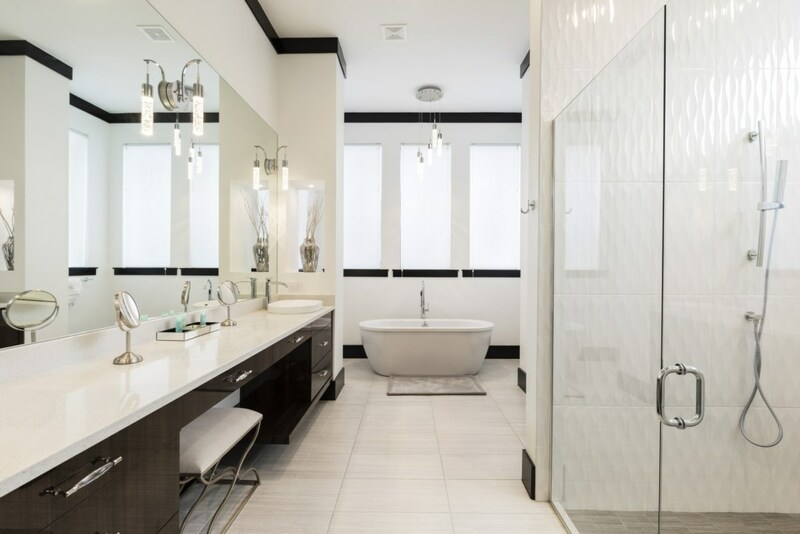 Set among the 3 beautiful landscaped PGA golf courses, the upscale gated community is not only the region's most beautiful, but most readily accessible. 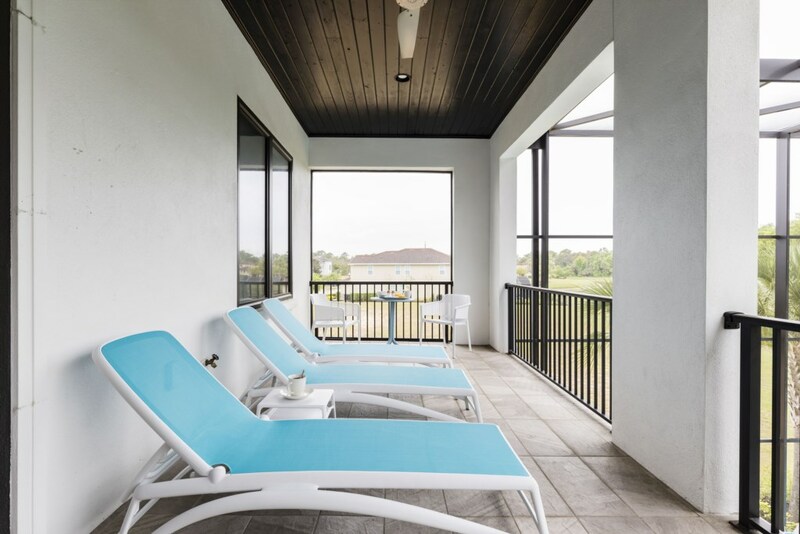 Interstate 4 is within easy reach of the resort and presents direct access to the theme park areas, literally just minutes away. 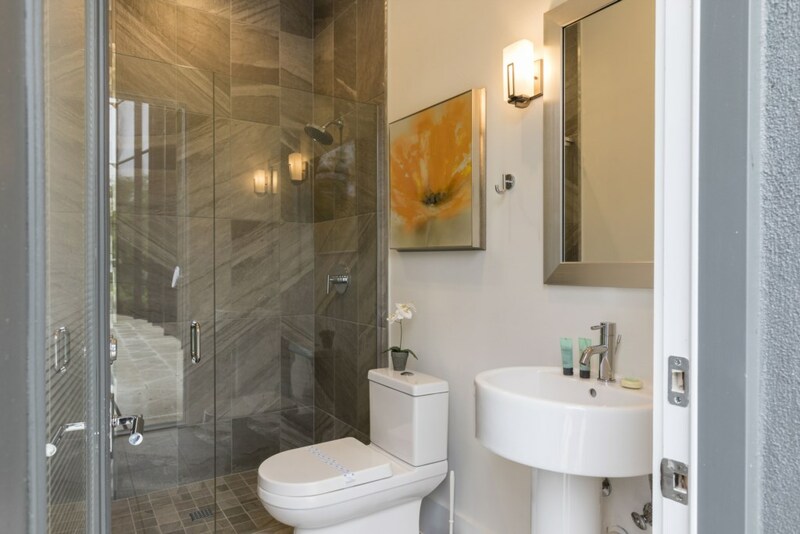 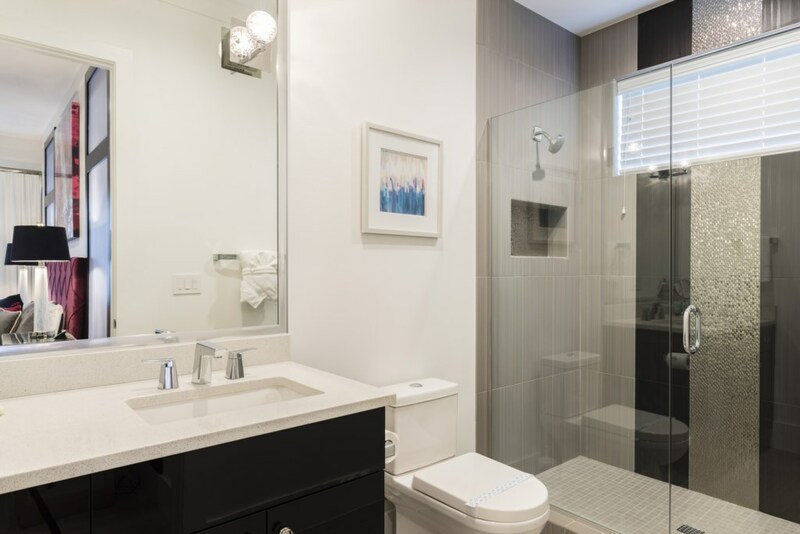 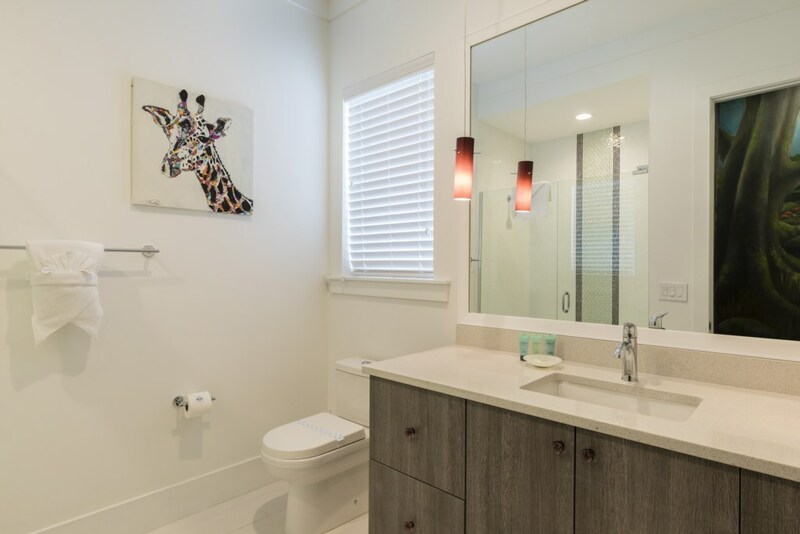 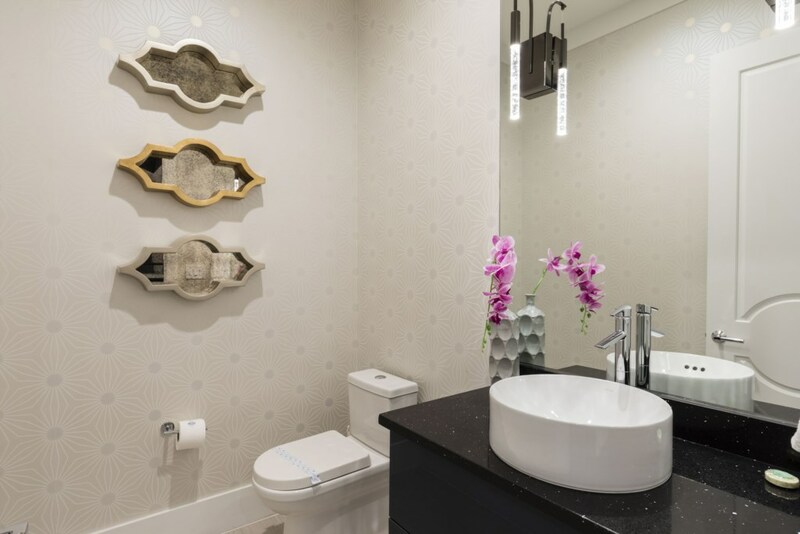 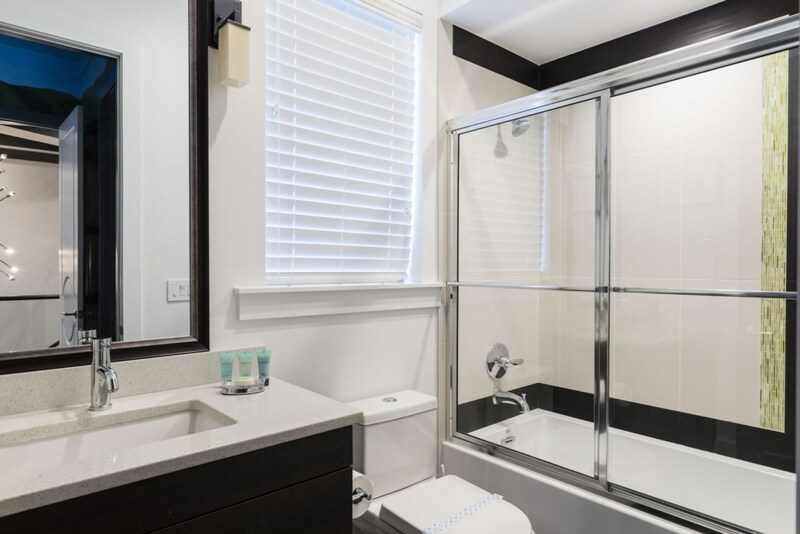 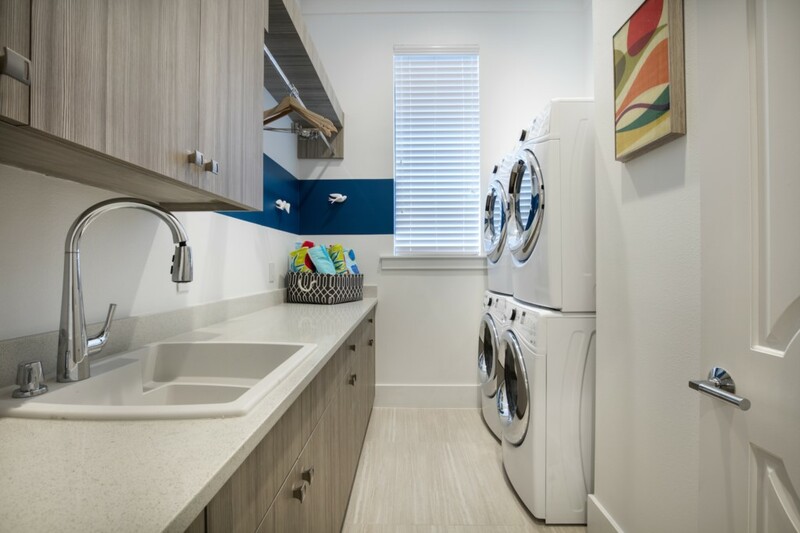 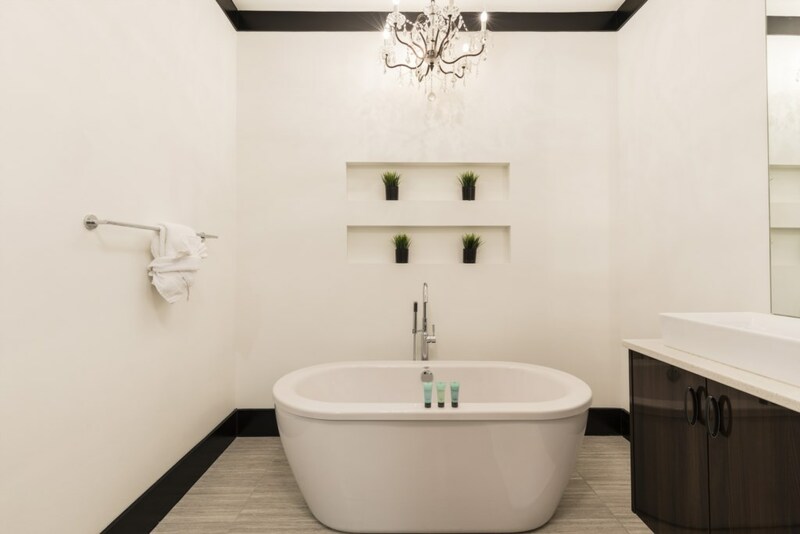 All of the main attractions, restaurants and golf courses of the tourism centre are close enough to enjoy, but just far enough away to ensure guests staying in these spectacular homes have a restful vacation in comfort and style!